• With the pace of the game market being what it is, new titles coming and going with every breath you take, I'm not surprised to see games getting rebooted into new editions sooner than they might have in the past. Doing so is a fine way to get attention for a game that might otherwise be overlooked as past its prime, while also drawing in people who might have been on the fence about it. Tokaido saw a new edition for its fifth anniversary in 2017, for example, and Suburbia is getting a souped-up, everything-in-one-box edition for 2019 on its seventh anniversary. You score only for cards that you remove from your deck and stash in your tomb, so if you keep using valuable cards for their effects and don't entomb them before the game ends, you could lose out on big points! Whoever collects the most valuable artifacts in their tomb wins. 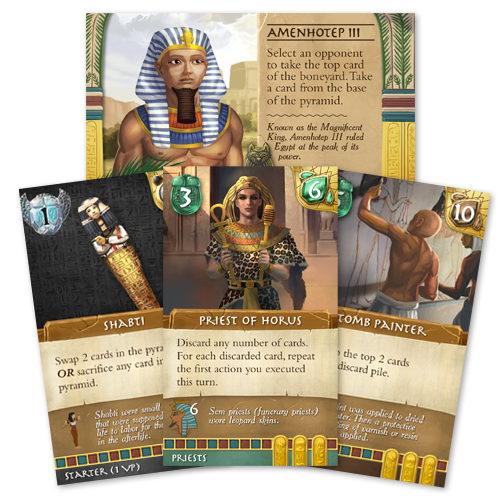 Valley of the Kings: Premium Edition includes all the cards from the three previously released games (Valley of the Kings, Afterlife, Last Rites), plus the components needed to play with a fifth and sixth player. It also includes rules for solo play, dividers for all the cards, and new pharaoh cards that give their holder unique abilities. The components are upgraded to 300+ tarot-sized cards. In Exodus Chronicles, you take on the role of one of six human factions, fighting for survival and dominance in an empire-building saga of epic proportions! Choose the primary path of your faction and elect the leader you believe is most capable of guiding your faction towards victory. Along the way, you must make clever decisions at every turn as you explore the sectors surrounding your home planet, expand the reach of your budding empire, exploit newly discovered worlds for their resources, and exterminate enemies that stand in your way. • Some new editions take longer than others, though, with Reiner Knizia's New Tactical Games with Dice and Cards from Blue Terrier Press being the first English-language release of a book that originally appeared only in German in 1990 from Hugendubel Verlag. Twenty-nine years between first and second editions, with that period of time practically spanning Knizia's entire game-designing career. As the title suggests, this book is a collection of game designs that you can play with a deck of cards, dice, and a few other components. Dan Laursen has posted a helpful overview of the book on BGG. 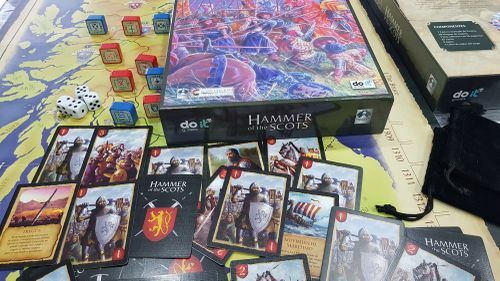 • Spanish publisher Do It Games was founded in 2018, and it's already released more than a half-dozen titles, including a new edition of Hammer of the Scots from Tom Dalgliesh and Jerry Taylor. Notes Do It's Artur Zanón, "This version has some differences from the Columbia one: mounted map 2,3mm., new card size and illustrations, rounded wooden blocks, a thick game box, two black cloth bags in which to keep the wooden blocks, and a new rules layout." War of the Worlds: The New Wave is an asymmetrical deck-building game with a playing board for two players. 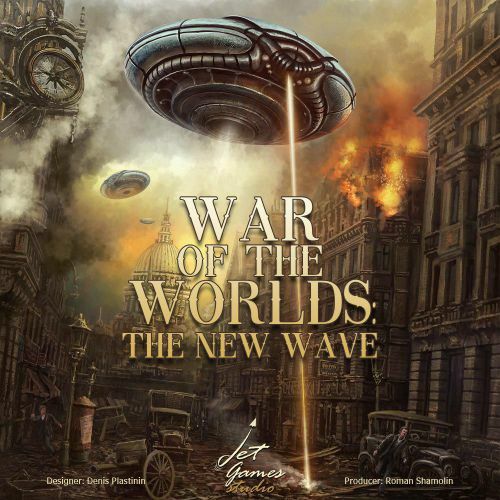 The game events unfold several years after the original "War of the Worlds" story by H.G. Wells. The extraterrestrial invasion is occurring once again, but this time the Martians have arrived on a giant spaceship that lands in one of the backwater districts in Scotland. During the game, one player commands the alien forces, and the other one leads the UK self-defense units. The main objective of the invaders is to completely annihilate the population of Great Britain, while the opposite side needs to deal enough damage to the Martian army. The game is played with two asymmetrical decks of cards, a playing board, tokens, and miniatures. It's so easy to miss game announcements these days, even when I'm doing almost nothing but that every work day. Sheesh!